George Roy William McDONALD (1883-1951), politician and businessman, was born on 29 January 1883 in Sydney, son of George McDONALD, Canadian-born contractor, and his wife Margaret Amy, née McNAMARA, from Brisbane. Known as Roy, he entered the public service in April 1898 and was deposition clerk, Broken Hill, before serving in Sydney and then as assistant clerk of petty sessions at Goulburn, Albury and Bathurst. In 1908 he resigned to become a land agent at Tamworth, and in 1911 moved his business to Sydney. In 1910, as Labor candidate, he was elected to the Legislative Assembly for Bingara, defeating the secretary for lands, S. W. MOORE. He proved to be highly critical of the Labor government’s land legislation: a move in 1914 to bar land agents from election to parliament seems to have been directed at him. McDONALD had repeatedly protested at attempts to dismiss from public office persons of German descent. In 1914 he had defended Dr August SCHEIDEL, naturalized since 1890, from critics seeking his internment; SCHEIDEL had reported slate and limestone deposits near Rylstone in which McDONALD acquired an interest. When Kandos Cement Co. Ltd was formed in 1919 to take over the cement works and colliery, McDONALD became a director and ceased to act as a land agent. He was also a director of Western Australian Portland Cement Co. Ltd and of the Southern Union General Insurance Co. of Australasia, and chairman of Carroll Musgrove Theatres Ltd and the New Caledonian Meat Co. Ltd. A founding vice-president of the National Roads and Motorists’ Association in 1924, he was a director of N.R.M.A. Insurance Ltd. He was later associated with several blue-metal quarrying enterprises, including the Brisbane Metal Quarries Ltd in which J. C. WATSON also invested. By 1928 Kandos Cement had extended its activities to New Zealand, but excess production led to its amalgamation with Australian Cement Ltd in 1929. As returns from cement and blue metals fell, he formed a company to buy the Imperial and Mount Victoria hotels. Granted nine months leave from the Legislative Council in 1923, McDONALD married May Camille DEZARNAULDS, from New Caledonia, on 4 September at Woollahra. As well as overseeing his business interests, he studied law and on 26 August 1927 was admitted to the Bar. His political views narrowed to protection of his own business interests and he opposed most of Labor’s reforms. In 1930 he resigned and stood unsuccessfully for Barwon; later he contested the Federal seats of Wentworth (1940) and Gwydir (1946). When a quota system for Australian feature films was introduced in 1935 he led the opposition from distributors. On 12 August 1937 he was admitted as a solicitor and established the firm, G. R. W. McDONALD & Co. Source: Heather Radi, ‘McDonald, George Roy William (1883–1951)’, Australian Dictionary of Biography, National Centre of Biography, Australian National University, http://adb.anu.edu.au/biography/mcdonald-george-roy-william-7337/text12735, published first in hardcopy 1986, accessed online 3 January 2017. Image source: ‘The Hon. 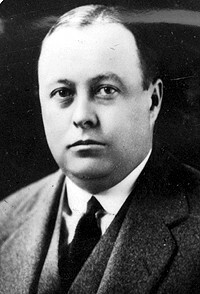 George Roy William MCDONALD (1883 – 1951)’, Parliament of New South Wales, https://www.parliament.nsw.gov.au/members/Pages/profiles/mcdonald_george-roy-william.aspx, accessed 3 January 2017.